Posted on 14, June 2016 by EuropaWire PR Editors | This entry was posted in Construction, Real Estate, United Kingdom and tagged GRAHAM Construction, Piece Hall, stonework of the Piece Hall. Bookmark the permalink. HALIFAX, 14-Jun-2016 — /EuropaWire/ — Repairs to the stonework of the Piece Hall, including the conservation of the historic fabric of the building, are now at an advanced stage and structural stone is being prepared by the stonemasons for the replacement of large columns on the Arcade level. Construction work in the courtyard is making good progress. Granite steps and limestone flags are being laid and the new water feature is being installed. Conservation works at the Westgate gate is ongoing with the weathervane and the bell being restored. The structure of the new Piece Hall extension is really taking shape! The concrete floors, structural steel and brickwork are now complete. The exterior curtain walling and glazing will soon be completed in preparation for the internal fit out. About 30,000 locally handmade bricks make up the walls of the new building. Every single brick was dawn by hand in the plans. Sample walls, constructed by GRAHAM on site, allowed the Council and LDN Architects to test the bricks and mortar, including how the colour changes when wet. The Piece Hall will eventually house a huge array of activities, welcoming up to 7,500 people at a time. From contemporary and classical music concerts, to intimate site-specific performances, seasonal festivities, including an ice rink and markets, alongside special food and drink celebrations. Free circus spectacles, outdoor sculpture and video mapping and major sporting events will all bring the space to life. 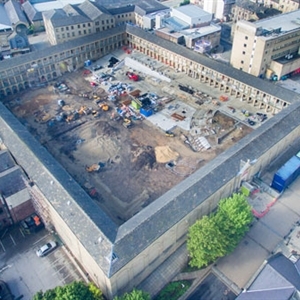 Please click here to visit the Piece Hall YouTube channel to view videos documenting the progress of the historic transformation.